Fiberoptic imaging was initially developed in the 1930s by a medical student named Heinrich Lamm. Lamm intended to visualize inaccessible regions of the body with his invention. Fiberoptic imaging became more visible in medical literature during the 1950s with further innovations by Hopkins and Storz. By 1963, Hirschowitz designed a medically functional fiberoptic scope with higher resolution, lighting, suction, and instrument ports. Current fiberoptic nasopharyngoscopes are lighted, are flexible with 2-way articulation, provide inline viewing with photo and video capabilities, and can have a distal diameter as small as 2 mm. Alternative visualization techniques include indirect laryngoscopy and laryngoscopy by angled telescope. The traditional indirect laryngoscopy relies on a single hand-held mirror to reflect the structures of the larynx to sight. Laryngoscopy by angled telescope allows a direct view of these structures also. Though these techniques may be less expensive and easier to use initially, fiberoptic nasopharyngoscopy (for the purposes of simplicity, indirect fiberoptic laryngoscopy is included under this heading) provides clearer visualization and better access to nasopharyngeal anatomy. The image below depicts an adult fiberoptic nasopharyngoscope. Adult fiberoptic nasopharyngoscope with 4-mm distal diameter, 2-way articulation, and video-recording capabilities. Fiberoptic nasopharyngoscopy can allow visualization of the following structures: nasal cavity, septum, middle meatal space and infundibulum, frontal recess, sphenoid ethmoid recess, turbinates, posterior choanae, eustachian tube orifices, adenoids, nasopharynx, posterior surface of the uvula and palate, velopharyngeal valve, adenoids, base of the tongue, pharyngeal and lingual tonsils, vallecula, pyriform spaces, epiglottis/supraglottis, glottis with mobility or immobility of the vocal folds and arytenoids, and immediate subglottis. The pharynx is a fibromuscular tube that is semicircular in cross section and is situated directly anterior to the vertebral column. It extends from the skull base to the lower border of the cricoid cartilage. Six muscles are predominantly responsible for the voluntary actions of the pharynx: three pharyngeal constrictor muscles that are roughly circularly layered on top of one another and three vertically oriented muscles (stylopharyngeus, salpingopharyngeus, and palatopharyngeus). The pharynx serves as a continuation of the digestive cavity, providing a route from the oral cavity proper to the esophagus. In addition, the pharynx communicates with the nasal cavity, the middle ear cavity, and the larynx. The pharynx is often described from an exterior view and an interior perspective. Based on the location, the interior of the pharynx is often separated into three sections—the nasopharynx, oropharynx, and laryngopharynx. For more information about the relevant anatomy, see Pharynx Anatomy and Throat Anatomy. In the nasal cavity, fiberoptic nasopharyngoscopy can visualize polyps, tumors, foreign bodies, or sources of epistaxis. In the nasopharynx, the scope can help identify suspected tumors or adenoidal hypertrophy. Images from nasopharyngoscopy in a 30-day-old infant shown in the images below. 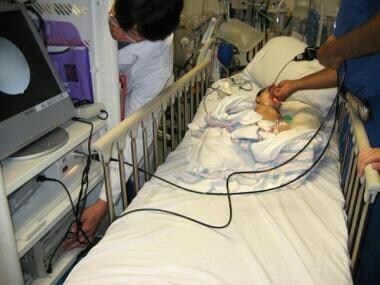 A 30-day-old old male infant who presented with upper airway stridor suspicious for laryngomalacia is being evaluated by nasopharyngoscopy. Omega-shaped epiglottis in 30-day-old male patient demonstrating laryngomalacia. In the vocal cords, polyps, nodules, masses, and paralysis can also be identified with fiberoptic nasopharyngoscopy. Epiglottitis is a contraindication to fiberoptic nasopharyngoscopy by inexperienced personnel, as it may result in laryngospasm and subsequent airway compromise. [7, 8] Experienced operators often evaluate suspected epiglottitis with nasopharyngoscopy. Relative contraindications include coagulopathies that might result in significant bleeding if even minor trauma occurs during the procedure. In the setting of craniofacial trauma, the benefits should be carefully weighed against the risks of inadvertent intracranial instrumentation and exacerbation of nasopharyngeal injuries. Nasopharyngoscopy is otherwise considered a benign procedure with few contraindications and complications in experienced hands. These agents most commonly include phenylephrine nasal spray (Neo-Synephrine), oxymetazoline nasal spray (Afrin), and lidocaine. For maximum effectiveness, lidocaine can be placed on cotton swabs or pledgets in the nose and allowed to absorb into the mucosa for several minutes. A combination of 1% phenylephrine and 4% lidocaine is commonly used (in a 50/50 mixture). Though procedural sedation may be necessary in young children, bracing the child during the procedure is usually sufficient. Fiberoptic nasopharyngoscopes, as shown below, can be selected in diameters ranging from 1.9 mm to 6 mm and in adult and child lengths. Starting with a smaller scope in a child may help minimize trauma. Additional equipment includes a camera (which can be attached to the viewing port of the scope), a video monitor (like the one below), a recording unit, and a image printer. 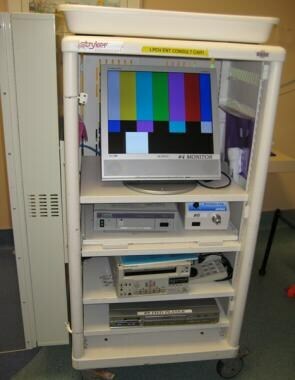 Video recording and display equipment used with nasopharyngoscopy. The clinician should also be prepared for the specific objectives of the procedure. For example, equipment such as a suction device, angled McGill forceps, and a Kelly clamp should be available for foreign body removal. During nasopharyngoscopy, the patient is usually sitting upright but can also be lying supine. If the patient is seated, a posterior headrest should be used to stabilize the head during the procedure, and the head should be stationed in sniffing position to bring the larynx and pharynx into optimal alignment. A right-handed clinician should hold the nasopharyngoscope in the right hand and stand to the left of the patient. The left hand can then rest on the patient’s nose to act as further stabilization and help guide the nasopharyngoscope and twist it to assist in guidance. Orientation of the distal tip may be controlled with the index finger or thumb of the right hand through the controller. Positioning is shown in the image below. Nasopharyngoscopy with upright positioning. Patient is in sniffing position while the right-handed clinician rests his left hand on the patient's face to stabilize the scope and controls the direction with his right hand. If the patient is supine, the clinician should stand at the head of the bed, also left of midline, with similar endoscopic control by the right hand. In this position, however, the likelihood of poor visualization of structures caudad to the nasopharynx is greater because of a posterior resting state of the base of the tongue. After proper positioning and application of anesthesia to the naris, lubricant should be applied to the nasopharyngoscope. To prevent visual obstruction, do not apply lubricant to the distal 2 cm. Some practitioners do not use lubrication. The patient should focus on oral respiration while the scope is inserted along the floor of the nose as in the placement of a nasogastric tube. If the lens becomes fogged, instruct the patient to swallow and then gently wipe the lens against the nasal mucosa or tongue (wiping in the hypopharynx can activate the gag reflex). Silicone spray also helps with fogging. 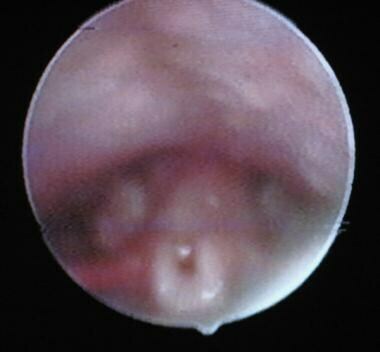 The scope should pass between the inferior turbinate and the septum until the soft palate can be viewed. The ease of this passage depends on the patient’s anatomy. Sometimes the scope should be passed above the inferior turbinate if it is easier to pass in this location. Direct the tip inferiorly to view the oropharynx and advance further. Here, the palatine tonsils appear laterally along the palatopharyngeal arches. Directly midline, the proximal tongue and the lingual tonsil can be visualized. Further caudal movement brings into view the epiglottis and the vallecula. Scan posteriorly to reveal the vocal cords, aryepiglottic folds, and pyriform sinus. For a better view of the anatomy, ask the patient to 1) protrude the tongue, 2) blow out the cheeks, and 3) vocalize the letter e.
Before removing a foreign body, the object should be clearly visualized without obstruction by mucous or blood. The foreign body should be judged easily accessible based on the practitioner’s experience, the grasping instruments available, the patient’s anatomy, and the level of cooperation of the patient. An inexperienced practitioner, an uncooperative patient, difficult anatomy, inadequate instrumentation, or any combination of these, can lead to airway trauma or worsened obstruction secondary to laryngospasm and further displacement of the foreign body, leading to aspiration. Nevertheless, a small foreign body can sometimes be removed with the scope using the side port for forceps. Further judgment is required to determine whether the foreign body can pass through the nose or needs to be extracted through the mouth. If these steps fail, procedural sedation or general anesthesia may be necessary. Fiberoptic endoscopic evaluation of swallowing (FEES) has emerged as a comparable alternative to video fluoroscopy and modified barium swallow in the evaluation of dysphagia. By visualizing the pharynx during swallowing, the patient can be assessed for delays in swallowing, laryngeal penetration, aspiration, and pharyngeal residue after swallowing. It is important to note that topical nasal anesthesia is currently controversial for this procedure owing to concern for the risk of desensitizing the pharyngeal or laryngopharyngeal mucosa, which would thereby skew results. However, current American Speech-Language-Hearing Association (ASHA) guidelines allow physicians to choose its use. Supraglottic sensation can be tested in the face of suspected brainstem stroke and aspiration risk. Note the video presentations below. Nasopharyngoscopy of infant to evaluate for tracheomalacia. 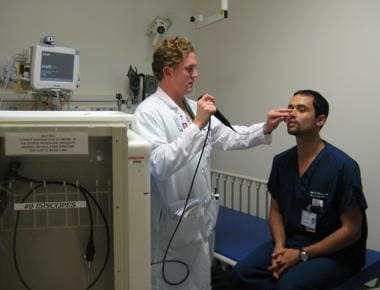 Demonstration of nasopharyngoscopy on an adult. Fiberoptic nasopharyngoscopy. Courtesy of Hamid R Djalilian, MD. Since patients are awake during fiberoptic nasopharyngoscopy, they can be easily startled by the invasive nature of the procedure. A clear explanation of the succeeding steps helps mitigate their concern. Nares are not always symmetrical. Selection of the more patent nostril reduces trauma. Minimize scope fogging with silicone drops and warming of the tip. Avoid contact with the epiglottis and vocal cords. Remember to compare symmetry and closely explore signs of trauma, hyperemia, and masses. As stated previously, vasoconstrictors can be used before laryngoscopy to minimize minor trauma and bleeding. If the camera is obscured or the scope is facing resistance, increasing force should not be used. A residual foreign body sensation, transient laryngospasm, and vasovagal syncope are also potential complications. Though existing studies show excellent success with laryngoscopy in removing foreign bodies,  these results are achieved in the hands of experienced operators. Those who do not use this technique frequently should be aware of the potential hazard of further impacting a foreign body and worsening an airway obstruction. For this reason, the equipment and personnel necessary to establish an alternate airway if the primary airway is lost should be available. Fuchs GJ. Milestones in endoscope design for minimally invasive urologic surgery: the sentinel role of a pioneer. Surg Endosc. 2006 Apr. 20 Suppl 2:S493-9. [Medline]. Hirschowitz B. 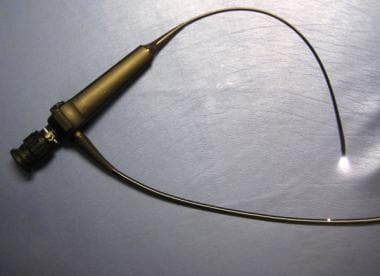 A fiberoptic flexible esophagoscope. JAMA. 1963. 2:388. Munter D, Heffner A. Esophageal foreign bodies. Roberts JR, Hedges JR, et al. Clinical Procedures in Emergency Medicine. 4th ed. Philadelphia, Pa: Saunders; 2004. Ch 40. [Full Text]. Elluru R, Willging P. Endoscopy of the pharynx and esophagus. Cummings C, ed-in-chief. Otolaryngology: Head & Neck Surgery. 4th ed. Philadelphia, Pa: Mosby, Inc; 2005. 79. [Full Text]. Welch K, Goldberg A. Sleep disorders. Lalwani A. Current Diagnosis & Treatment in Otolaryngology—Head & Neck Surgery. McGraw-Hill Companies, Inc; 2004. 39. Bentsianov BL, Parhiscar A, Azer M, Har-El G. The role of fiberoptic nasopharyngoscopy in the management of the acute airway in angioneurotic edema. Laryngoscope. 2000 Dec. 110(12):2016-9. [Medline]. Cantrell RW, Bell RA, Morioka WT. Acute epiglottitis: intubation versus tracheostomy. Laryngoscope. 1978 Jun. 88(6):994-1005. [Medline]. Arndal H, Andreassen UK. Acute epiglottis in children and adults. Nasotracheal intubation, tracheostomy or careful observation? Current status in Scandinavia. J Laryngol Otol. 1988 Nov. 102(11):1012-6. [Medline]. Patton DD. Office procedures. Nasopharyngoscopy. Prim Care. 1997 Jun. 24(2):359-74. [Medline]. Ngan JH, Fok PJ, Lai EC, et al. A prospective study on fish bone ingestion. Experience of 358 patients. Ann Surg. 1990 Apr. 211(4):459-62. [Medline]. Choy AT, Gluckman PG, Tong MC, et al. Flexible nasopharyngoscopy for fish bone removal from the pharynx. J Laryngol Otol. 1992 Aug. 106(8):709-11. [Medline]. Faber CE, Grymer L. Available techniques for objective assessment of upper airway narrowing in snoring and sleep apnea. Sleep Breath. 2003 Jun. 7(2):77-86. [Medline]. Svensson M, Holmstrom M, Broman JE, et al. Can anatomical and functional features in the upper airways predict sleep apnea? A population-based study in females. Acta Otolaryngol. 2006 Jun. 126(6):613-20. [Medline]. Soares MC, Sallum AC, Gonçalves MT, Haddad FL, Gregório LC. Use of Muller's maneuver in the evaluation of patients with sleep apnea--literature review. Braz J Otorhinolaryngol. 2009 May-Jun. 75(3):463-6. [Medline]. Dudas JR, Deleyiannis FW, Ford MD, et al. Diagnosis and treatment of velopharyngeal insufficiency: clinical utility of speech evaluation and videofluoroscopy. Ann Plast Surg. 2006 May. 56(5):511-7; discussion 517. [Medline]. Neumann S, Romonath R. Effectiveness of nasopharyngoscopic biofeedback in clients with cleft palate speech: a systematic review. Logoped Phoniatr Vocol. 2012 Oct. 37(3):95-106. [Medline]. Langmore SE. Evaluation of oropharyngeal dysphagia: which diagnostic tool is superior?. Curr Opin Otolaryngol Head Neck Surg. 2003 Dec. 11(6):485-9. [Medline]. Kamarunas EE, McCullough GH, Guidry TJ, Mennemeier M, Schluterman K. Effects of topical nasal anesthetic on fiberoptic endoscopic examination of swallowing with sensory testing (FEESST). Dysphagia. 2014 Feb. 29(1):33-43. [Medline]. [Full Text]. Wrigley SR, Black AE, Sidhu VS. A fibreoptic laryngoscope for paediatric anaesthesia. A study to evaluate the use of the 2.2 mm Olympus (LF-P) intubating fibrescope. Anaesthesia. 1995 Aug. 50(8):709-12. [Medline]. Alalami AA, Ayoub CM, Baraka AS. Laryngospasm: review of different prevention and treatment modalities. Paediatr Anaesth. 2008 Apr. 18(4):281-8. [Medline]. Wai Pak M, Chung Lee W, Kwok Fung H, et al. A prospective study of foreign-body ingestion in 311 children. Int J Pediatr Otorhinolaryngol. 2001 Apr 6. 58(1):37-45. [Medline]. Ricchetti A, Becker M, Dulguerov P. Internal carotid artery dissection following rigid esophagoscopy. Arch Otolaryngol Head Neck Surg. 1999 Jul. 125(7):805-7. [Medline]. Medscape Reference gratefully acknowledges the contributions of previous authors Erik D Schraga, MD, Staff Physician, Department of Emergency Medicine, Mills-Peninsula Emergency Medical Associates, and William R Ryan, MD, Assistant Professor, Head and Neck Oncologic/Endocrine Surgery, Department of Otolaryngology-Head and Neck Surgery, University of California, San Francisco, School of Medicine, to the development and writing of this article.